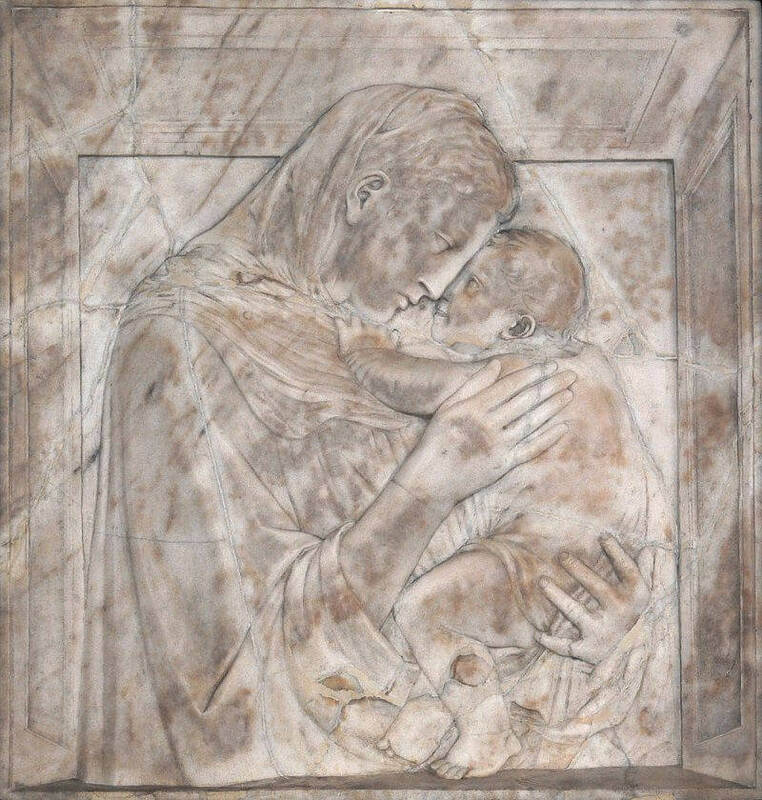 The Madonna Pazzi, housed today in Berlin's Staatliche Museen, is rectangular marble relief that dates from c. 1425. It was carved for private devotion during the beginning of the productive collaboration that Donatello formed with Michelozzo (1396-1472), an Italian architect and sculptor. Under Donatello, Michelozzo had assisted in the building of the sacristy of Santa Trinita, where Ghiberti had started to fuse together late-Gothic and antique forms. Both Donatello and Michelozzo began as sculptors with an uncompromising dedication to antiquity, as seen in their collaboration for the decoration of the tabernacle of St. Louis of Toulouse. Michelozzo also became the partner responsible for the architectural frames of Donatello's sculptures, including the funerary monument of John XXIII. In 1428, together with Donatello, Michelozzo erected an open-air pulpit at an angle of the Cathedral of St. Stephen at Prato, designed for the regular public displays of their famous relic, the Girdle of Thomas (Sacra Cintola). The reception of the Madonna Pazzi was clearly favourable, as there are several copies. The Virgin is depicted in half-figure with the Christ Child carefully cradled in her arms. She gazes penetratingly into her son's eyes, foreseeing his death. Both figures are portrayed without a halo; Donatello is instead interested in their earthly, realistic presentation. The focus is on the intense intimacy shared between mother and child, extending the capabilities of Byzantine iconography with a newfound expression of tenderness. The baby leans affectionately towards the mother, adding intimacy to the compact scene. Delicacy is further expressed by the sculptor's careful delineation of Mary's silk garment. The relief is celebrated for its extraordinary virtuosity, as demonstrated by the three-dimensional hands, remarkably shallow in depth (actually a few millimetres thick), with the left represented in foreshortening. The sense of depth is accentuated by the plain frame device surrounding the scene, shaped like a window, separating us from the intimate scene, making the figures appear rounder and more lifelike. Copyright © 2009 - Present www.Donatello.net. All Rights Reserved.